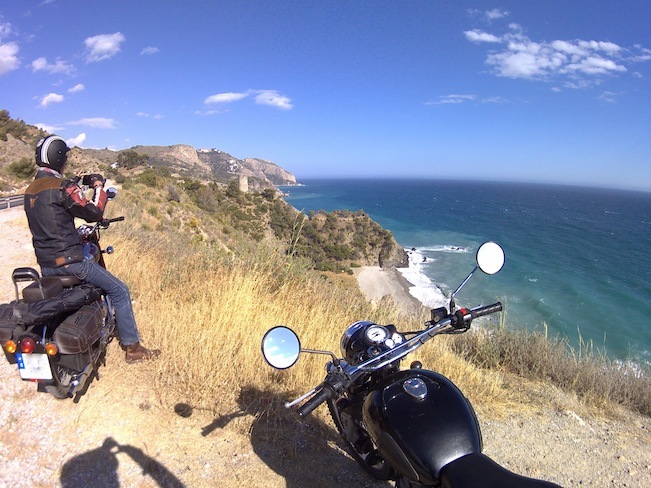 On our 8-Day Guided Motorcycle Tour you will be riding some of the most awesome roads in Spain. 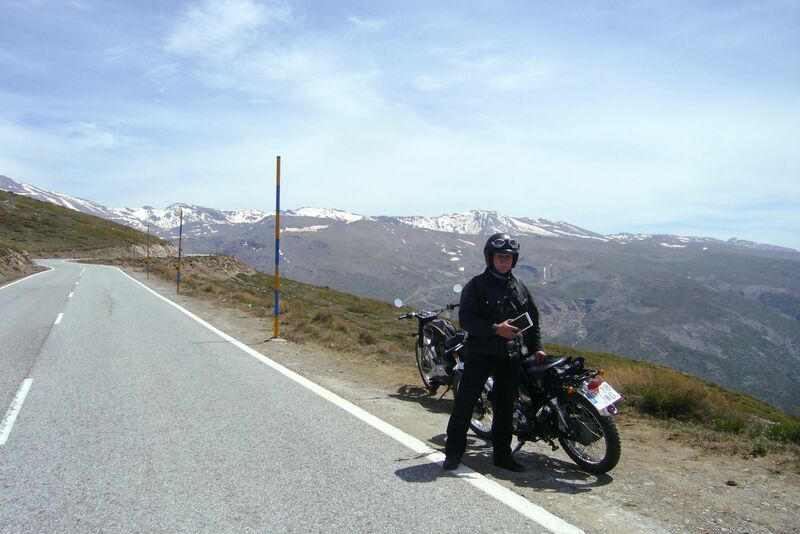 Visiting areas of truly outstanding natural beauty such as Los Acantilados de Maro-Cerro Gordo Natural Park and Las Alpujarras, you will be taken on an unforgettable motorcycle trip. 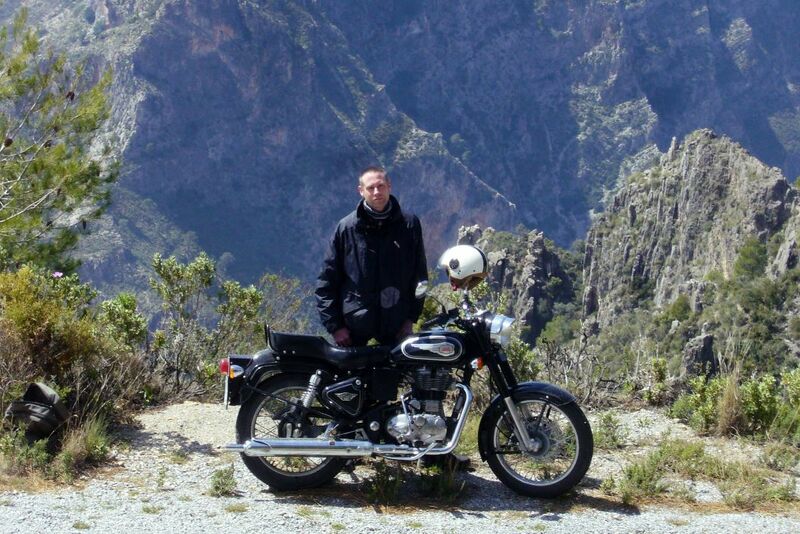 Experience this on a Royal Enfield Bullet and you will soon discover how amazing these robust machines really are. They are highly utilitarian, ample in power/performance and a blast to ride, the perfect bike for touring this part of the world! 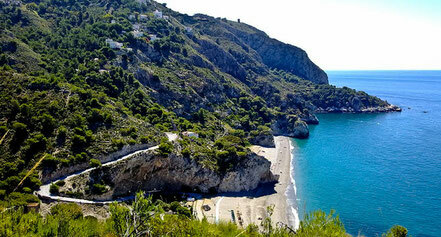 Day five of this tour will include an exploration of the magnificent "Cuevas de Nerja". This series of huge caverns stretching for almost five kilometres are home to the world’s largest stalagmite, a 32 metre high column measuring 13 metres by 7 metres at its base. After lunch you can relax on one of the many small beaches or swim and snorkel in the crystal clear water of the Mediteranian Sea. If you fancy something a little more adventurous, we can also organise scuba diving or sea kayaking. Come and explore this beautiful corner of Europe and discover the "Real Spain", we guarantee you will not be disappointed. 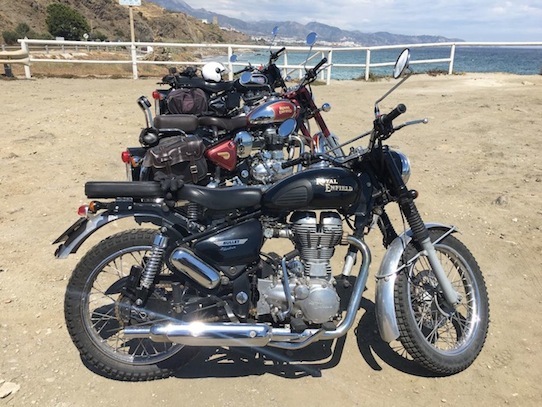 You are more than welcome to join this tour on your own Royal Enfield or Classic Moto, check out our prices at the bottom of the page. Arrive at either Malaga (AGP) or Granada (GRX) airport, where you will be met by one of our staff and transported to the guesthouse in Velez De Benaudalla. After filling out the required paper work you will be given a short safety briefing and introduced to your Royal Enfield. Following this, you have the remainder of the day to do as you please. There is a good choice of restaraunts and tapas bars in the village, some offering their menus in English. 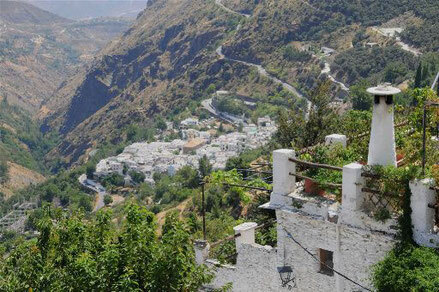 Feel free to wander through the narrow winding streets in the old Arabic Quarter of the village taking in the stunning views of the Sierra Nevada, surrounding countryside and 15th century Moorish Castle at the top. After having breakfast, our Tour begins. Heading south east, through Tajo de los Vados Gorge and the small mountain village of Lentegi, we arrive in "El Parque Natural Sierras de Tejeda, Almijara y Alhama." 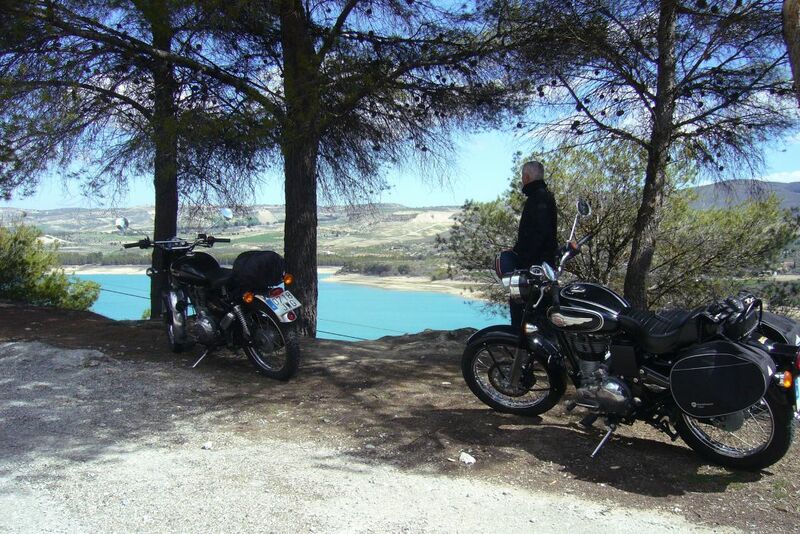 Riding along El Camino De Cabera we start heading west towards Pantano de los Bermejales (El Lago Azul) and Alahama De Granada where we shall stop to have lunch. We will then head off around the north side of the lagoon and start to make our way back towards Las Sierras De Albuñuelas and Otivar arriving back at our HQ around 6:00pm. 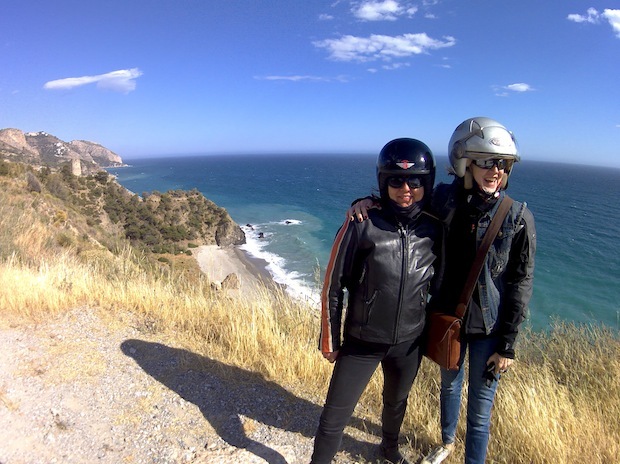 A fabulous day on the road is promised with stunning views out over the sea as we journey south to Salobreña, then west along the coast towards La Heradura and Los Acantilados de Maro-Cerro Gordo Natural Park. 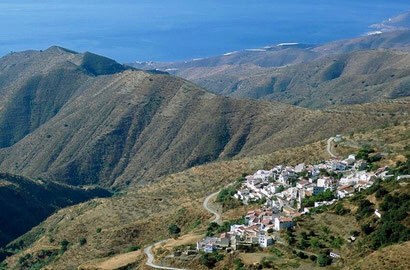 Turning inland we start our ascent to Frigiliana passing through the picturesque village and onto La Sierra De Competa for some stunning views of the Andalucian coastline. 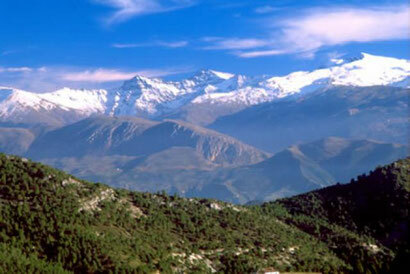 Hopefully, if the conditions are right, we will enjoy some views of Morocco across the Mediteranean sea. Winding our way along "La Ruta de Mil Curvas" (the route of 1000 curves) we will arrive at Canillas De Aceituno where we shall stop for lunch. Starting our descent heading south again, we pass through Árchez then Torrox before turning east and following the coastal road back to our base. 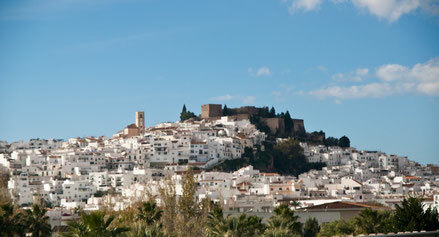 This morning we'll set off in the direction of Granada before heading east through Lanjaron and into "Las Alpujarras." 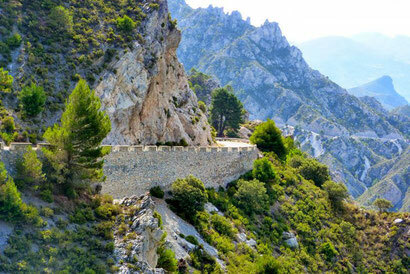 Todays tour passes through Spain's highest mountain villages, Pampaneira, Capileira, Bubion and Trevelez, (the highest village in Spain) where we will be stopping for an authentic “Alpujarreño” lunch. Heading off again we pass through Juviles and Bérchules before turning south west through Cadiar for our return journey to our base in Velez. 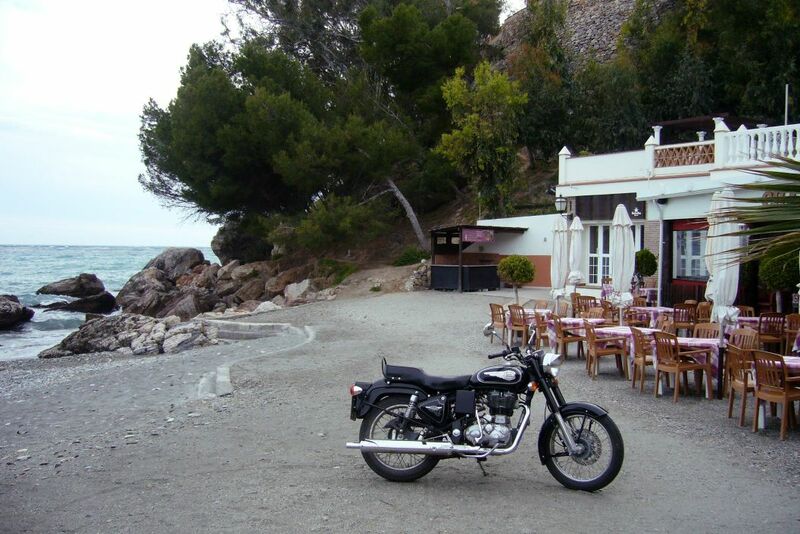 This morning we will take a break from riding and travel by car to the quiet, picturesque little fishing village of Maro to visit the magnificent "Cuevas de Nerja". This series of huge caverns stretching for almost five kilometres are home to the world’s largest stalagmite, a 32 metre high column measuring 13 metres by 7 metres at its base. After visiting the caves we shall head towards Nerja, stopping off on the way to view the impressive "Aqueduct de el Aguila". Built in 1879 to carry water from Nerja town to the local sugar refinery in Maro, it is still in use today carrying water for local irrigation. 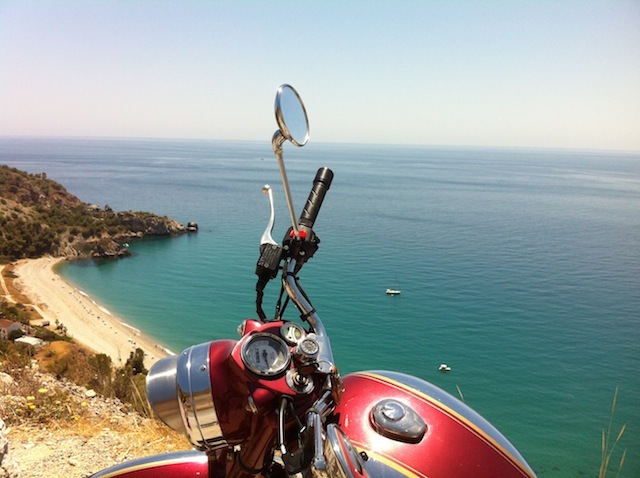 Arriving in Nerja, we make our way to "Balcon De Europa" for lunch, and take in the stunning views of both the Costa Tropical and Costa Del Sol. After lunch you can relax on one of the many small beaches or snorkel and swim in the crystal clear water of the Mediteranian Sea. Following breakfast, today will see us travel east to Torviscon and Almegíjar. Turning south from Cherin we head for Embalse de Beninar before ending up at Murtas where we shall be visiting a traditional bodega and stopping for lunch. 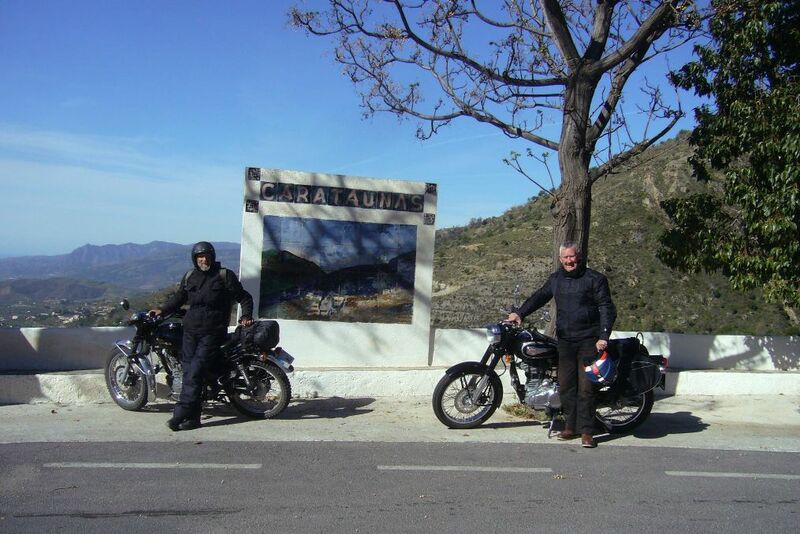 On our return journey we continue along "La Sierra De Contraviesa" before winding our way south through La Sierra De Alheyon and west along the coast road towards Malaga and our final leg of the journey back to base. Today will see us head west to Sierra Los Guajares then north towards Granada ending up in "La Parque Natural De La Sierra Nevada" where we will stop to have lunch. Heading off again we make our way to Guejar-Sierra and Pinos Genil before making our final descent through Suspiro Del Moro and Acebuches to our HQ in Velez, arriving back around 6:00pm. You are leaving today, so will be transported to the airport for the flight home, hopefully you will have had an unforgettable experience with us. 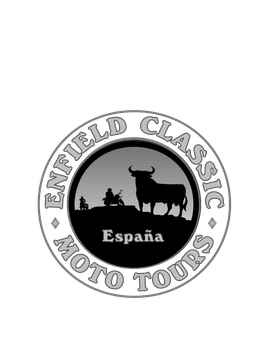 Goodbye for now and thank you for booking with Enfield Classic Moto Tours. On some of the above dates we can be flexible depending on the volume of bookings, if you would like a custom made tour, please contact us with your specific requirements and we will try and arrange alternative days/dates. 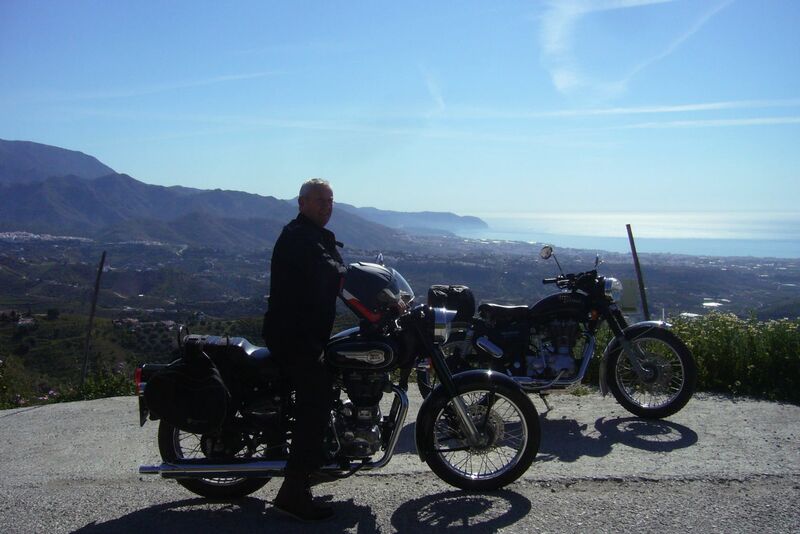 The price of our tours include renting one of our Enfields, third party liability insurance, fuel, services of an experienced English/Spanish-speaking guide/mechanic throughout the trip, self catering accommodation in our guesthouse and transfers from Malaga (AGP) or Granada (GRX) airports. (Our guesthouse is self catering with full cooking facilities, there are shops and supermarkets in the village if you like to prepare your own food or you can eat out at the tapas bars or restaurants). 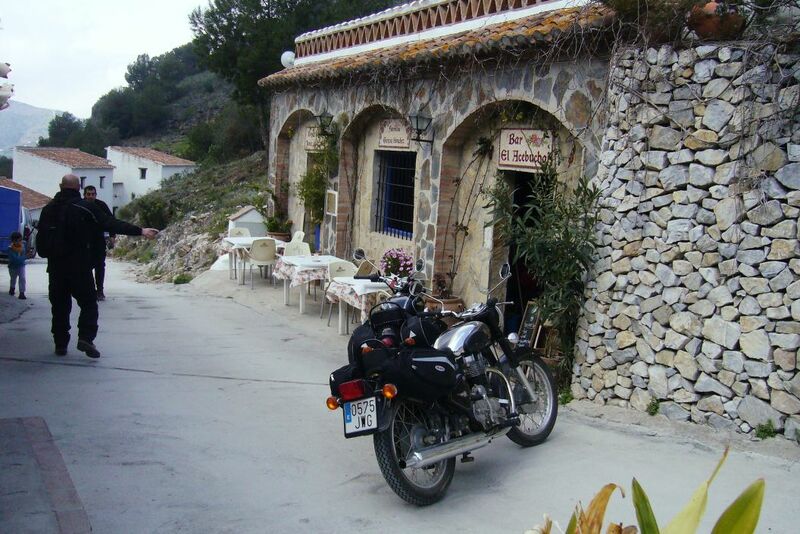 On arrival at our Guesthouse you are required to pay an Accidental Damage Deposit of 500€ (or equivalent if you prefer to pay in your local currency) in cash to cover damages to any of the motos. This will be returned in full at the end of your tour, provided no damage has been caused. Most of us have dropped our bikes at some stage of our riding career, I have found Enfields to be very forgiving in this respect. Minor damage can sometimes be fixed easily in-house but sometimes it can not. 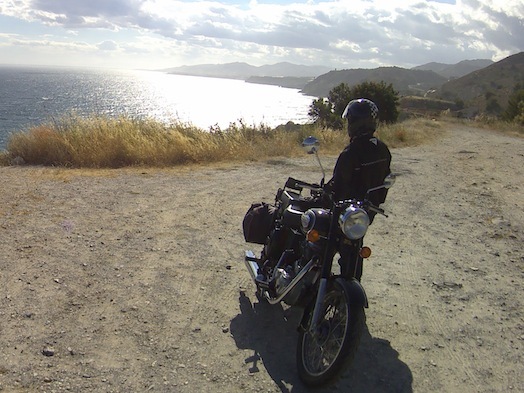 If any of the motos are dropped or crashed causing damage which cannot be repaired in this manner, you are liable for the cost of the repair and this will be deducted from your Accidental Damage Deposit. Thankfully this is a rarity!